Over 2,000 residents of Yinghong Township, Guangdong Province, protested against regime corruption in the afternoon of May 23, 2009. The protesters clashed with a few hundred armed police, and the incident ended in bloodshed. According to a witness, one protester was killed in the clash and at least 100 were injured. The encounter happened around noon. Policemen attacked the crowed with batons and police dogs, while the protesters threw rocks at the police and burned two police vehicles. A female protester died in hospital after being injured by the police. Police then cleared the site at around 6 p.m., using trucks to wash the blood off the street. Hong Kong’s Oriental Daily quoted Chen, a Vietnam Chinese who was injured in the conflict, saying that the police had disabled the entire town’s internet to keep the news from spreading. Yinghong Township is home to tens of thousands of Vietnam Chinese who returned to China during the Sino-Vietnam War in the 1970s. Most work in the local tea farm. For decades the residents have lived in poverty because local officials have been seizing their land and increasing rents. Residents also claim that their retirement funds and subsidies granted by the provincial government have also been lost to graft. The protest was triggered by the recent arrest of three township officials on charges of embezzlement. 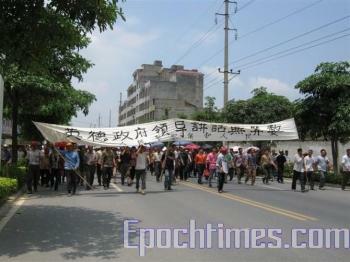 Indignant residents demanded the township government return the embezzled funds. After their request was refused, they decided to march to the municipal government to appeal, and the violent quelling ensued.